When I started powerlifting in Fall 2016, I truly didn't think I'd compete in a powerlifting meet. I joined my powerlifting gym for the sake of gaining strength and hitting personal PRs, while improving my form. About 1 year into powerlifting, I started to reconsider the idea of competing at a meet. After hearing about others' experiences, it sounded fun to just go and do my personal best - not to measure myself against others. It seemed very in line with why I competed in half marathons... again, to do MY best. I didn't have to be the fastest in a race or the strongest in a competition to enjoy the experience. So, I decided to participate in my first powerlifting competition and here's how it went! I decided I wanted to compete in January 2018 for a competition that a few of my fellow gym-goers were signed up for in March 2018. At that point, I started going to my powerlifting workouts very consistently where my coach programmed the workouts to ramp up for the meet. I've got to say, I was surprised about the lifting program to prep for the meet. I thought it would be a lot more intense. But here's how it really went... We cut back a lot on accessory movements about a 1-1.5 months before the meet, lifting more consistently heavy (but not overly so) on the core lifts, and focused on one core lift per week leading up to the meet to go very heavy and very low rep (1-2 reps). Oh yeah, and #singletsaturdays started - if you haven't seen those powerlifting singlets, go take a look. The focus was to dial in just those core lifts while not overworking our bodies. The week before the meet was basically light core lifts to really heal up before the meet. This did make me nervous as I like to over prepare and lifting light didn't feel like over preparing for a powerlifting meet. In regards to my weight class... I wanted to compete in the 57kg weight class (125.5lbs) because I was sitting around 128-129lbs and that just seemed manageable. I decided to do a slow cut from the end of January to March to try to meet that weight class. 100% honest: that was not fun and I think it affected the energy levels that I was able (or really not able) to put towards my lifting progress. While feeling weak during my lifts, I also wasn't able to cut that much weight - I ended up around 127lbs the week before the meet. So, my coach and I decided to cut down calories by a large chunk the Tuesday before the meet. I went from about 2,100-2,000 calories/day to about 1,700 calories/day. That may or may not sound like a lot, but it felt like a lot to me. While it was tough, it worked! I ended up weighing in at 123.8lbs on that Sunday (meet day). If I could do it again, I would've either not cut at all to compete in the higher weight class OR cut weight in the last week to avoid a couple months of weak sessions. Since we were just discussing my weight cut - after weigh-ins, I ate A LOT and it felt so good! I was so glad I packed a lunchbox of food including: dried mangos, Lenny & Larry's cookies, a Czech cream cheese kolache, a protein shake, and a BIG coffee! Those light, recovery lifts during the week before the meet... yeah, those must've worked! I PR'd on squat (170lbs) and deadlift (226lbs). I did have a minor mishap with bench, where my shoulder was tweaked during the lift-off of my first attempt, so I ended up with a 121lbs bench which is 10+ lbs off of my personal best and 15+lbs off of my planned PR attempt. Oh well, all in all, I felt I had a very successful meet in terms of my performance! As well, my coach was my 'handler' during the meet, so he gave the judges my next lifting numbers, helped me with warm ups, and just made it easy on me to soley focus on my lifts. He was great! While hitting PRs was awesome, what I loved almost as much, if not more was seeing and meeting other really strong women lift. It was fun to see girls in my weight class lift amounts of weight I thought were only achievable by borderline professional lifters. Since I'm competitive, that lit a fire in me to push myself harder, as I've now seen girls my size lift so dang much. Lastly, my meet was a great experience to go and cheer on my other gym mates and fellow lifters! If you're considering competing, my thought is: why not?! 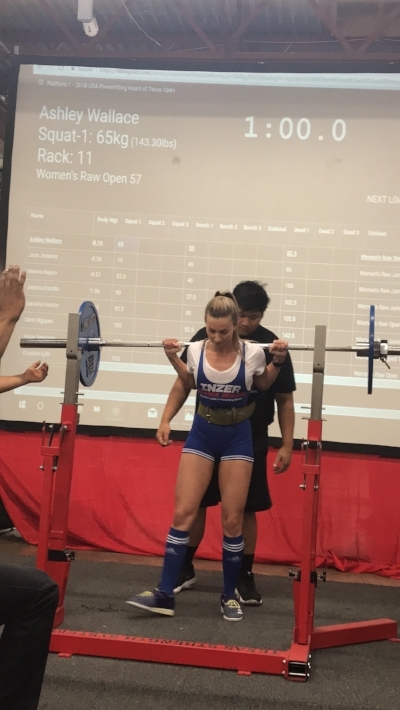 The powerlifting community is an awesome and supportive community, so there's no need to feel that you aren't "good enough" or "strong enough" to compete. You are enough.